Employee compensation and headcount schedule model allows you to develop budget, keep track of actual and analyze personnel compensation and headcount for two consecutive years at a time. 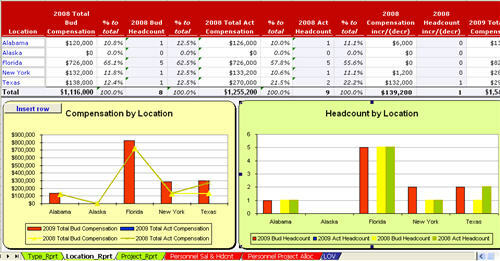 Employee compensation and headcount schedule model includes Personnel Salary and Headcount worksheet that enables you to create budget and maintain existing employee and new hires salary, fringe, salary increases/decreases, and bonuses. 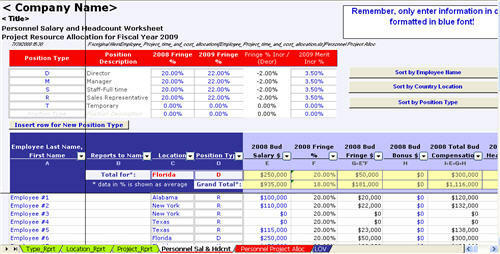 The worksheet is designed to accommodate budgeting for various position types. 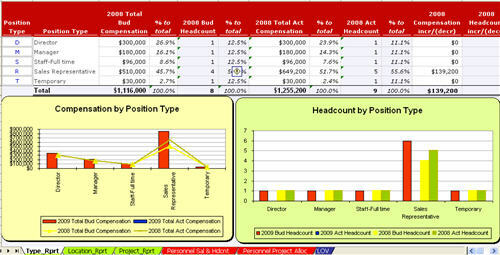 Model includes comprehensive compensation and headcount analysis reports by location and by employee type.